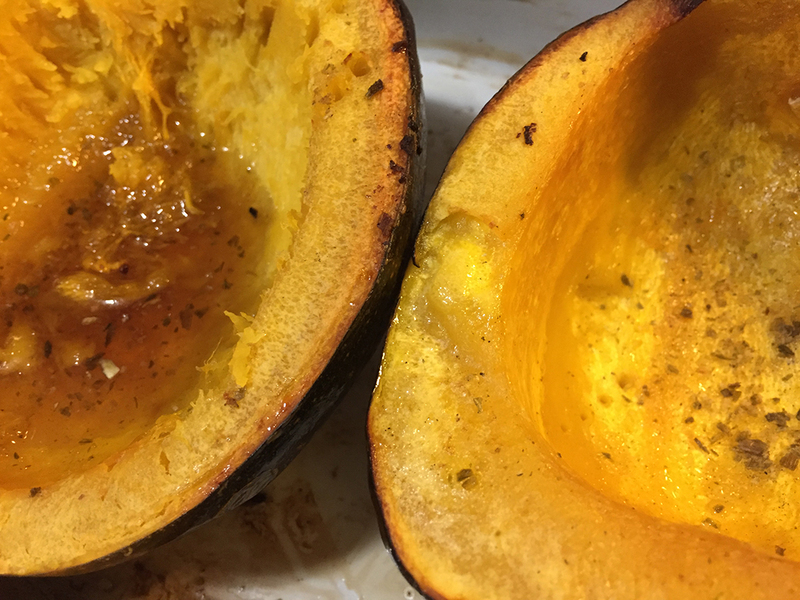 Growing up, my mom prepared acorn squash by cutting them in half, scooping out the seeds, and placing them cut side down in a baking pan, then added water halfway up the sides of the squash. For the last 10 minutes of baking, she turned them over and filled the cavities with brown sugar and butter. The squash were delicious, but kind of mushy. Today, I am oven-roasting the squash without water. Instead, I rubbed the squash with coconut oil prior to baking for a nice caramelization. Delicious and not mushy! (Sorry mom). 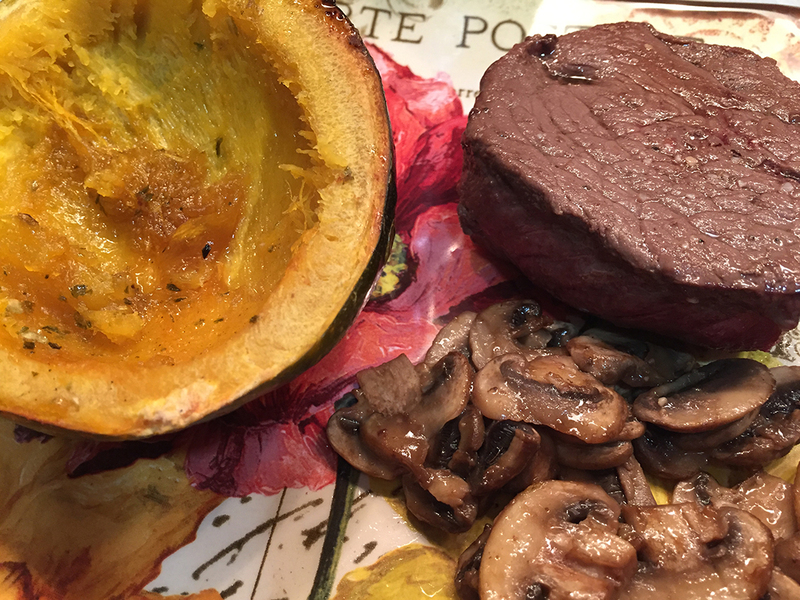 Following is a step-by-step guide for delicious acorn squash every time. Wash the acorn squash and then cut in half, lengthwise. Scoop out the stringy pulp and seeds. Cut the squash in half from stem to tip: Start on one side of the stem and cut straight through until the knife stops hitting resistance and you’ve cut through to the hollow middle. Continue cutting around the acorn, through the tip, ending up on the other side of the stem. Do not try to cut through the stem. Break the squash in half: Put down your knife and hold the squash in both hands. Pull the two halves away from each other, cracking the shell at the stem. The stem will stay with one half and leave the other half clean; you can trim away the stem if you want, but I usually leave it in. Scoop out the seeds: Use a sturdy spoon to scrape out all the seeds and stringy bits from inside both squash halves. You can reserve these for roasting in the oven, if you like. Rub the squash halves with oil: Set the acorn squash halves cut-side up, like bowls, in the roasting pan or on the baking sheet. Add a little coconut oil and use your fingertips to rub it all over the cut surface and inside of the squash. Sprinkle liberally with sea salt and desired herbs. Roast in the oven, cut side down: Set the timer for 45 minutes. Check doneness by poking with a fork, taking care not to pierce the skin. At this point, turn the squash over, add butter and brown sugar if desired. and bake another 10-15 minutes. When done, the halves will be caramelized and roasty around the edges, and you should be able to easily poke a fork or knife all the way through the flesh. Eat immediately, or cool and refrigerate up to 5 days. 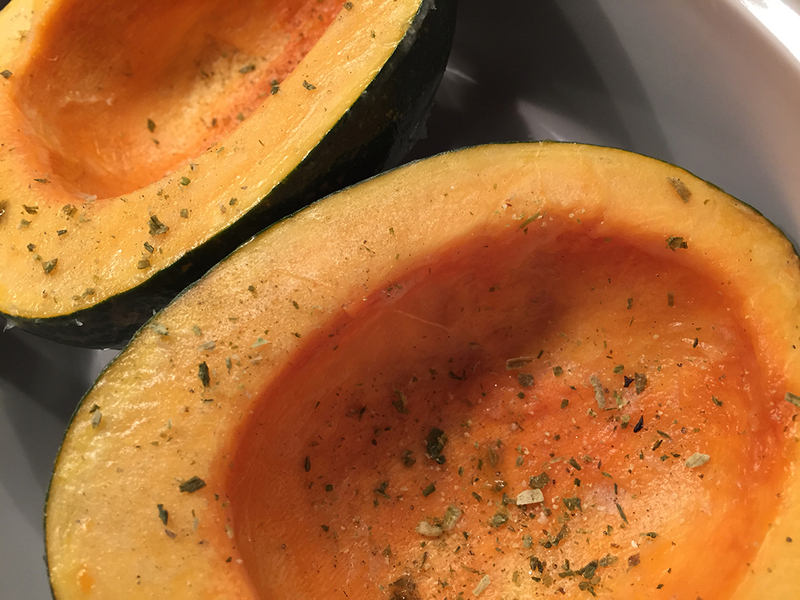 Left squash has butter and brown sugar, right squash has seasonings and herbs.